Did the Newfoundland Herald violate the Human Rights Code, the Criminal Code and The Charter of rights when it published a blog post from american extremist "Christian" Blogger Matt Barber entitled "The Coming Christian Revolt' ? Western Pride NL thinks so and has filed a human rights complaint with the police. The issue lit up the local Twiitersphere today. Here is a jpeg of the article? Do you think Barber is nuts? 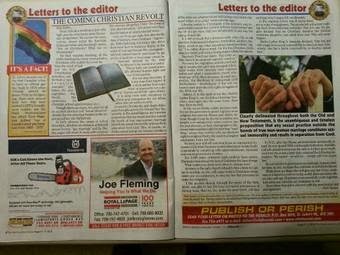 Has the Newfoundland Herald provided a forum for the incitement of hate?